As the Head of Public Services, Irene supervises the staff and services of the Circulation Department and the Reference Department. She also coordinates research instruction and library services for students, faculty, staff, and Friends of the Library. In addition, Irene teaches New York Legal Research and appears as a guest lecturer in various courses, serves as a liaison to the Legal Clinic and the Public Advocacy Center, and regularly provides assistance in the Reference Office. Irene joined the Library Faculty of the Gould Law Library as “Reference Librarian & Digital Archivist” in 2010. 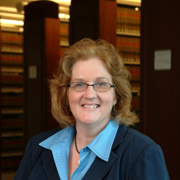 In that role, she was instrumental in developing the Digital Commons initiative at Touro Law Center, which highlights the scholarly writing of Touro faculty. Prior to becoming a law librarian, she worked as an attorney in private practice in the areas of estate planning and administration, real estate, and corporate and partnership law. Irene has served as an adjunct professor at Long Island University, Dowling College, and St. Joseph’s College.